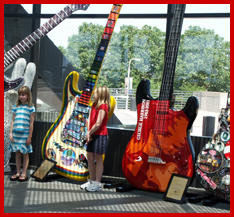 KidznFun :: Article: Cleveland Rocks, Rolls and Does All Kinds of Stuff! Cleveland Rocks, Rolls and Does All Kinds of Stuff! "I had this album!" the not-so-old woman shouted, laughing, her hands on the headphones as if to hold the song inside her head. "I had this on an eight track tape!" It’s easy to be catapulted down memory lane at Cleveland’s Rock and Roll Hall of Fame and Museum. Few stimuli evoke memories like songs from your past. Especially songs from your youth. And those songs - and the personalities who sang them - engulf you in this high-tech, multi-story, I.M. Pei-designed building (complete with glass pyramid a la Paris’ Louvre). Your toe starts tapping the minute you enter. The last song you hear plays on in your head long after you depart. But, I had to ask myself, what about the kids? Is this just so much mom-and-dad nostalgia? Worse, is it granny-and-gramps junk? Judging from what I saw (and heard) - no. The Rock Hall, as its known locally, has become Cleveland’s top tourist draw, attracting some half a million visitors annually. Not a bad thing, I think, especially if it helps draw attention to bounty of family activities in and near the city. Of which there are many. But the folks who operate the Hall venture far beyond honoring sensational rock musicians, or just fanning fans’ flames in order to make them once again young and swooning over Ricky, or Elvis or Jimi. No, there’s a true commitment here to chronicling, documenting, exploring and explaining the roots of rock-and-roll music. And it starts upon entrance to the main exhibit hall, where a small movie theater presents itself. I saw many people opt away from the movie, lured aside by the glittering, multi-colored, multi-media displays that filled the first floor in a cacophony of sound, light and color. But, it’s essential that a visitor view the two multiple-screen, fast-paced films shown in adjacent viewing rooms. The whole experience lasts perhaps 15 minutes, but you come away with at least a sense that rock never existed in a vacuum; it didn’t pop onto the air waves by magic. It had origins. And these films give a quick immersion into those roots. From there - if you leave yourself open to understanding that the whole purpose here is to explain and explore those roots, their ongoing manifestations and how genres have flowered into various branches - the entire place becomes a musical family tree. The kids I saw seemed to be picking up on it. Few, if any, eyes rolled as moms’ and dads’ memory-loaded eyes glossed over. To paraphrase the great Chuck Berry song - there was a whole lot of sharin’ goin’ on. Cleveland, however, has a lot more to share than the Rock Hall. The group I was with lodged at the Glidden House (yes, that Glidden - the paint people; the hotel was once a family mansion), at University Circle. University Circle is literally that - a circular roadway. Within its circumference stands one of the country’s densest collections of cultural institutions. The Museum of Natural History and Planetarium, the Botanic Garden, the Cleveland Art Institute, the Cleveland Children’s Museum, the African American Museum, HealthSpace, the Museum of Contemporary Art, the Western Reserve Historical Society/Crawford Auto-Aviation Museum and the Temple Museum of Religious Art all sit within spitting distance of each other - and of Case Western Reserve University. Clearly several days’ exploration can be made here, indoors and out. As I walked to the Historical Society, I passed a passel of kids climbing all over a gigantic dinosaur outside the Natural History Museum. Dinosaurs are among that museum’s major attractions, including "Happy," the 70-foot-long Haplocanthosaurus delfsi, reputed to be the world’s oldest exhibited sauropod. I’m not sure I like the anthropomorphic idea of nick-naming extinct animals but, even so, anytime you see dinos, they capture the imagination. As do exhibits like the reconstructed skeleton of 3.2 million-year-old "Lucy," reported, when discovered in 1974, to be an entirely new species of human ancestor. Natural History holds all that you’d expect from a major institution of its type - planetarium, gems and jewels, prehistoric life, insects, birds and more are among the permanent exhibits. The changing exhibits for this summer and autumn include lions and Jane Goodall’s world of chimpanzees. But, I was headed for the Historical Society, specifically to see the car and plane collection. I’m a sucker for old cars and planes. Okay, for any kind of machinery. And, maybe this is more traditionally a boy-child’s thing than an attraction for girls, but some pretty cool classics are displayed on two floor. They’re not very well displayed, unfortunately - laid out in staid, relatively dimly lit, low-ceilinged rooms. But when the 20th century is spanned from 1909 Hubmobiles to DeLoreans - including some unique demo cars made from stainless steel - you can’t help but marvel. Toss in a few bi-planes and other aviation machines of local historical significance, and you’ve got yourself an hour’s fine entertainment. Back around the Circle, the Cleveland Children’s Museum was calling my name. Housed in a former Howard Johnson’s restaurant, it’s small, but folks here are downright friendly. An excellent place for those with younger kids (up to eight years) to spend an inclement day, the museum makes the most of its limited space, which is decorated nonstop with walls painted bright blues and greens, and colorful graphics everywhere. A veritable beehive of daily themed activities are hosted. In the Activity Room, for example, a "Feels Like Summer" exhibit that explored different textures was in place, and this theme was being backed up with story times and activities. Cows were also being celebrated, as July had been dubbed "ice cream month," and the temporary display/activity was called "Healthy Ever After." It focused on staying active and eating right, with activities like a low-rise balance beam circle, slides, and more. Kids take "passports" and check in at stamping stations - all in a room perfectly fitted, size-wise, for little ones. The Children’s Museum also holds a farmyard-themed Red Barn room, where little folk can practice motor skills and interact with their folks and each other through puppet animals, accompanied by farm sounds. Downstairs, kids obtain "cash" at a mini bank, fully outfitted with ATM, and may spend it at the very popular junior-sized grocery store. I was particularly taken by "Splish Splash," a climbing installation in which kids become a water droplet in the water cycle, clambering to "raindrop" platforms in interlaced nets. Adjacent is mini TV studio where they can become broadcast meteorologists, and a water play table that’s guaranteed to hold tykes attention for quite a while. Just across the street stands the Cleveland Botanical Garden. The Garden’s centerpiece is The Eleanor Armstrong Smith Glasshouse, a large greenhouse-style structure that houses two biospheres - the Madagascar spiny desert and the Costa Rica cloud forest. In truth, no matter what kids see in here, just being the environment will strike their imaginations. But, the stark contrast between the dry desert and the drippy forest lends an instant insight into the huge range of environments that harbor life. The cloud forest caught my fancy more than the desert. But, that’s no surprise. What’s not to like about a place that’s filled with colorful flowers, a waterfall and dozens of butterflies scooting through the air? Outside, a handful of families explored the Children’s Garden. An Alice in Wonderland kind of place, here were plants to water (with water hand pumped into colorful watering cans), a "planters patch" in which to dig, a huge tree house to climb into and a "bird blind" in which to hide and observe. You’ve gotta love that blind: on the wooden wall are posted photos of and explanations about birds, butterflies and animals that you just might see when looking through the slots. Then look through the slot and you actually see that animal - a full-sized, 3-D wooden figure. Very cool. My favorite spot? A nifty, hidden display with flowers growing out of an old, brightly painted file cabinet. With the summer heat coming on strong, I retreated to the air-conditioned indoors. 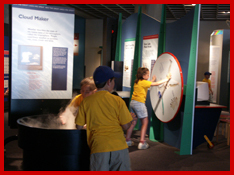 This time to the Great Lakes Science Center. Science museums are all the rage these days, and most cities of any size have them. My problem with these installations is jealousy. Why the heck didn’t we have these kinds of places when I was a kid? This is approachable, hands-on science. Science made fun. Forget about memorizing periodic tables or chemical formulae. Push this button, or make this noise into that tube, and just watch what happens. Cool? Yes. And if it’s cool enough kids will want to find out why things happen. The major question about them is this: is the local museum any good? In Cleveland, the answer is - yes. I’ve explored science emporia from New Jersey to San Francisco, and I’d say Cleveland’s version ranks with the best. A thoroughly modern structure, it allows exploration through an open floor plan that handles throngs of enthused kids. Huge picture windows look out onto the lake, the Rock Hall and a snug harbor where a submarine and the steamship William G. Mather are moored and open as museums. A pleasant patio on the ground floor level allows a stroll to these sites or a nice spot to sit and snack. The top floor's expansive balcony affords the same view, and is also equipped with a sailing schooner playground where kids can climb, tunnel and otherwise command the vessel in imaginary voyage. One very cool Imax theater is found near the main entrance, one of the few with a domed screen. Truth: I stayed out. A domed Imax would be guaranteed to make me seasick. But, I spent a lot of time playing on computers that helped me understand various phenomena of the Great Lakes. Watched a dozen kids test out a huge variety of physics action on the upper floor. And watched an actual tornado in action. And more. Changing exhibits, of course, are among the most important draws to a museum like this, and the one on display at that time, Body Works 2 was certainly an eye-opener. Here, graphic and lifelike human and animal figure sculptures, "exploded" to reveal the muscles, internal organs and bones, depicted motion during various activities. Imaginative? Informative? Artistically striking? Yes. But, this was definitely a display for more mature kids and adults, and something that required much time to truly absorb. The kid stood beside the home plate image emblazoned on the artificial turf's dirt-colored surface. He swung an imaginary bat and a grin emerged across his face. At the other end of the visitors' bull pen, his brother toed a pitching rubber and mimed launching an unhittable fastball. A young man stood on the right field warning track and leapt at the wall, left arm outstretched to its limit, to rob a dream-hitter of an imaginary home run. Only a select few of us will ever be skilled and lucky enough to play on a major league baseball field. 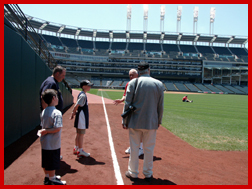 But, the behind the scenes stadium tour at Jacobs Field, home of the Cleveland Indians, at least puts you on the field for a few moments. It also puts you in the dugout, the bullpen and, particularly interesting to we ball fans who write for a living, into the press box. This tour, from which all proceeds benefit Cleveland Indians Charities, is worthwhile for anyone who has baseball in his heart. Jacobs Field ranks among the older "new" stadia around the majors. The architecture was developed to reflect the cityscape around it, and to highlight facets of other storied stadia. Light standards mirror skyscraper buildings seen behind the stadium. (Terminal Tower looms beyond left field; it was the model for the Daily Planet building in "Superman.") Bridges in right and left field reflect Cleveland's moniker as "the city of bridges" (passing over the Cuyahoga River). The left field wall is nicknamed the "Mini Monster;" it's modeled on Fenway Park's "Monster," albeit standing at half the height. But, for the kids on this tour - a pair of elementary schoolers from greater Pittsburgh touring with their dad - and for the kids at heart, me, my colleague Percy and a twenty-something guy from Boston with tickets to that night's game against the Red Sox - the chance to walk along the outfield track or to sit in the dugout was treasured. For a minute or two, you are in the major leagues. For a fleeting second you're warming up in the pen to come in and save the game, or searching the bat rack as you prepare to make the game winning hit. I was scheduled to leave town - to head for the surrounding countryside - and it seemed I’d only scratched the surface of family things to do. Such as? The Cleveland Symphony Orchestra’s Blossom Festival Band performs summer concerts such as "The Blossom Festival Band Goes to the Circus" at Severance Hall. Cain Park in Cleveland Heights stages free jazz concerts on summer Sunday afternoons, as well as a folk music fest in June and an arts festival in July. The KidzArt series in Cain Park includes storytelling, dance, kids’ circus and concerts. The non-profit, environmental awareness raising Burning River Fest takes place in August with music, food, dance, stilt walkers, balloon artists, face painters, jewelry artists, sculptors and other fascinating goings-on. Nautica Entertainment Complex, a 100-year old renovated Powerhouse, has Powerplay, an arcade for children and adults. And concerts are staged, along with special outdoor events, and dinner cruises on the Nautica Queen. Conduct a space shuttle launch at the NASA Glenn Visitor Center and test out the interactive "Aero Adventure" exploration of aircraft propulsion. The Cleveland Museum of Art offers free "Family Express" events every Sunday. A trip to the zoo is always fun. The Cleveland Zoo is no exception. Water ski, jet ski, or otherwise indulger in water play in Lake Erie. The city’s 14 parks and Cuyahoga Valley National Park present 52,000 acres in which to play. Travel to the nearby countryside to Geauga Lake, a major water park, Amish country, wine county (where many fests and special events are staged) and the Holden Arboretum. See Cleveland Countryside for more on these. Cleveland is a hit. A trip worth making. All too well I remember when the city's immediate claim to fame was the polluted Cuyahoga River literally burning (that’s why they call the new environmental fest "Burning River"). No more. The only thing that's burning here now is the intensity of its progression into a vibrant twenty-first century burg.